This is plated with an anti-corrosive finish, Commercial Grade and Quality. 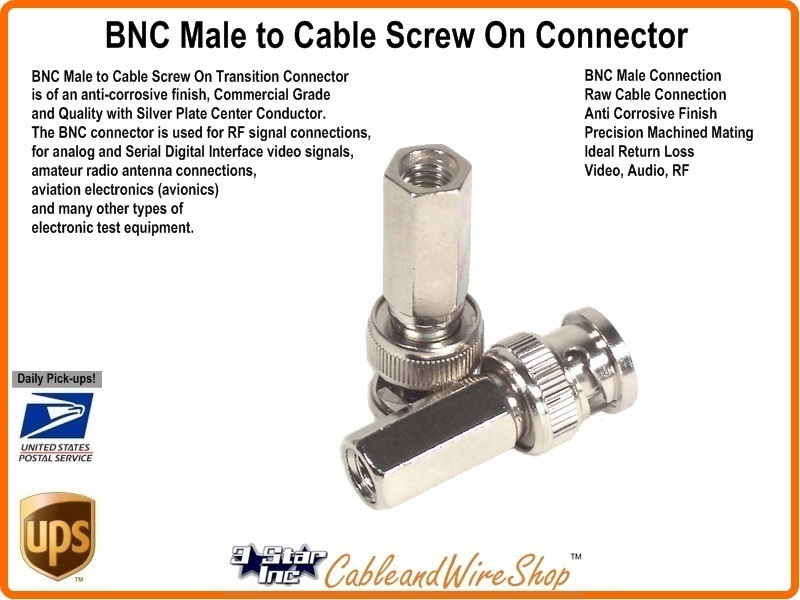 The BNC connector is used for RF signal connections, for analog and Serial Digital Interface video signals, amateur radio antenna connections, aviation electronics (avionics) and many other types of electronic test equipment. The Screw-on connection is made for RG58 solid center conductor in a temporary scenario and cannot be relied upon as a permanant usage connector as wear and usage will break down the physical connection between the soft raw cable components and the connector. Note: Technicians will use this adapter to transition from Antenna, Cable TV and Satellite Feeds to Test Equipment Leads without needing Specialty Prep and Crimp/Compression Tools normally required for affixing a BNC to cable end.